This is Dani Sue. She was my first Cardigan and my first show dog. She has nice thick bone and a beautiful front. She is powerful, and can out run the other dogs (if she wants to - which isn't that often!) So... 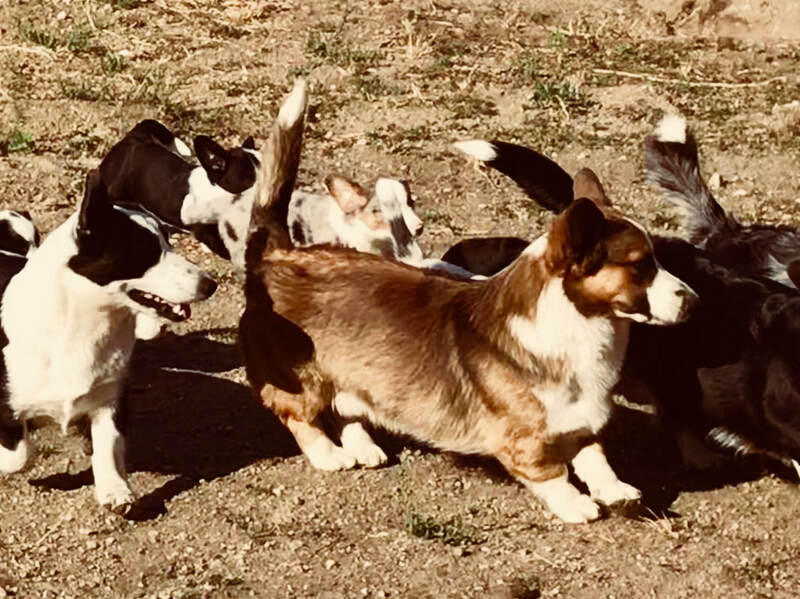 I would say she is a laid back girl, but this is not true when her herding instincts kick in (she will herd the broom, the kids, the other dogs, etc.) which gets her acting like a puppy again with that spring in her step. Riley Cute is Canadian bred, Black and White with Brindle points, from Eyespy Kennels, which is located in Ontario, Canada. She has a lovely short coat that is super soft. She is my best not-so-much shedder. Her personality is very sweet. She is a leader, but she isn't stubborn in her leadership. She is willing to work with other dogs, and always ready to meet new people with a waggy tail. 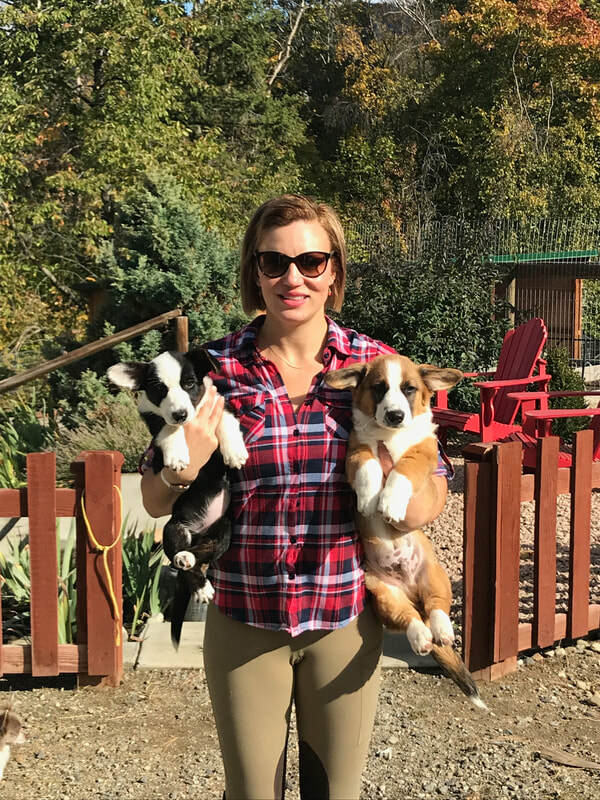 She can move out in the ring like no other Corgi! I cannot wait to get her started on agility. Misty and Bailey. My third and fourth Cardigan. Young Bailey with his big sisters. ​Misty is from Legacy Legends, located in Alabama, USA. 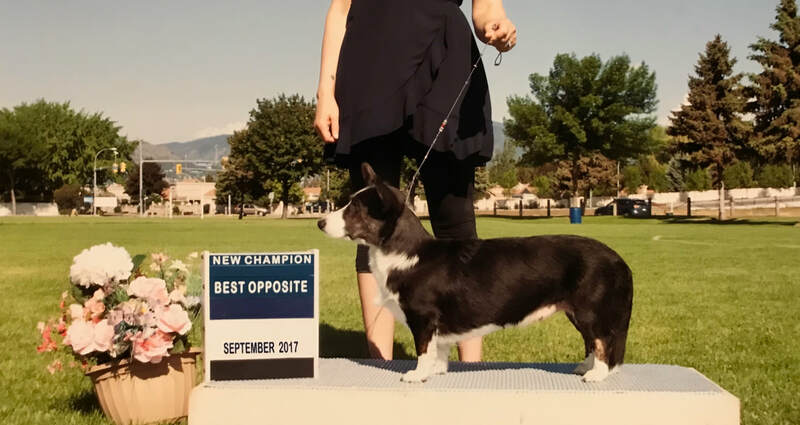 Both her parents are Grand Champions. She is built to perform. She is still young but I expect great things from her in the ring to come. Personality wise, she is loyal, energetic, loves to play with other puppies, and when she tires out, she wants to sit at the feet of the human of her affection; that's me. She also loves it when I let her sit on my lap or at the end of our bed. She loves to be near her family. Her hair is lovely too; a little course so she can shake and presto she is clean. Great for a climate with four seasons. This is Nalla our newest addition. She is Dani Sue's puppy. Her father was the number one Cardigan in Canada at the time of the breeding. His name is Bluetrix's Zorro Longmire, an energetic black and white Cardigan with a bold personality. Nalla enjoys playing as all puppies do! I will be introducing her to Conformation at the puppy level in Spring of 2019. Until then I will do some obedience and socialization, and of course puppy classes!